Rack Cards Printing Services - Quality Printing at 24 Hour Print! Rack cards are primarily used for commercial advertising and can be seen frequently on convenience stores, hotels, restaurants, landmarks, and other places with high foot traffic. In designing rack cards, it is a must to use high impact graphic designs and catchy headlines. Make something completely different from your previous promotional materials by turning your rack cards into magazine inserts, a map to your store, or anything that your creativity permits you to make. 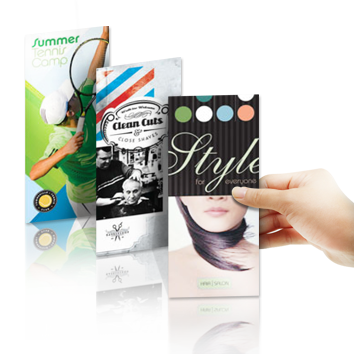 Here at 24 Hour Print, you can print rack cards with perforations, greatly used as promotional materials. We print them on thick and durable card stocks like 13 pt. and 14 pt. These cards come in two standard sizes and are printed in bulk, ranging from 250 to 100,000. You can opt to have the cards printed on the front only, or have them printed on both sides. Printing turnaround options include 6 business days, 4 business days, and 2 business days. If you have questions on our rack card printing services, contact us via live chat or dial 1-844-380-7056. You can also ask help on setting up your files before printing or ask questions about our free file setup template. Templates can help you with bleed and margin setup for rack cards, especially the ones with perforations.